On May 1st I will be presenting a reading as part of PREAMBLES AND PERAMBULATIONS, an exhibition at the Dickens House Museum curated by Island Projects. More about the event can be seen here. On 13th April 2010, thinking about what I will read, I went to the Dickens Museum at 48 Doughty Street in Bloomsbury. On the top floor there was a small display dedicated to Dicken’s own practice of reading aloud. 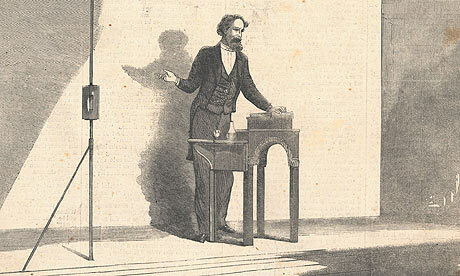 I noted Dickens specially built reading table that accompanied him on tour, particularly the small box placed on top and on which the hand holding the book would rest. I wrote: This suggests that book reading is like a cumbersome prosthetic, how the act of reading in public is a complex act requiring a cumbersome architecture of body appendages and extensions. Rather than standing at the reading table, one crawls inside it to get more familiar with one’s own texts. I also examined a display case of the reading copies, from which Dickens read. These were subject to various methods of annotation, including pencil underlining and the highlighting of sections of text in red and blue. Inparticular I noted that Dickens sometimes crossed out paragraphs in the printed text, and replaced them with a handwritten alternative. I thought these might be slight rearrangements of grammar, possibly to bring out rhythms more striking for reading aloud. 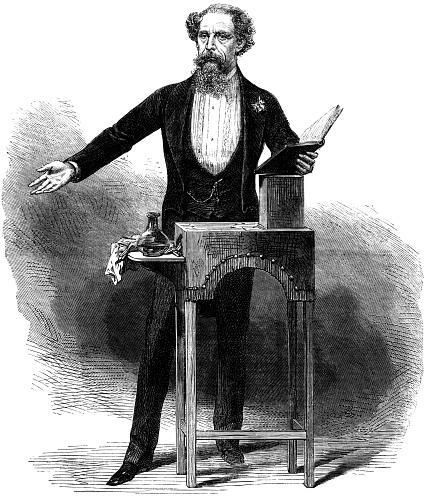 Whilst there may be some obvious reason for this shift apparent to Dickens scholars, I appropriated the shift between paragraphs as evidencing the demands of reading aloud, shifting from private absorption to public performance, and the transformations of matter, style, and story that necessitates. Coming downstairs into the library, I noticed in one corner a reproduction of Dickens reading table (the original upstairs had been in a glass case, which suggested a Dickens still reading, muffled, behind glass). But it lacked the small square – covered in the same dark red velvet – that Dickens rested hand and book upon (see image above). My response to the reading table had focussed upon that red square block. I wondered where it was, if the reproduction had ever included such a thing. I note some reasons for this fascination: its nature as building block, minimalist cube (fringed with a dark red tassle), mobility, wrist podium, something to be found hanging from every book like furry dice from a car window. It is the block that fits the reading stand into the scale of Dicken’s body, giving form to a void space between human and object, reader and book, but such form is temporary/provisional/”blocked”. Hopefully, the block can levitate on its own if carrying around the reading stand proves difficult. In fact, I noted, the reconstruction [of the reading stand] is noticeable for its lack of animating props, its denial of the prosthetic nature of reading aloud. No ivory paper knife that functioned as a prop, never to cut paper; no jug of water; no cloth or towel. My image of how to use this reading table was becoming ever more physical. I IMAGINED DICKENS wiping his brow and the back of his neck with the towel like a boxer, sweat pouring onto the altered paragraphs of his page. I imagine a script of Dickens reading aloud that involves no books, just a choreography of sweat, box, jug, water, ivory paper knife. From Boa Constrictor to Norfolk Fat Lady. She always said that that first visit had made London just like Dickens and Dickens had always frightened her. As she says anything can frighten her and London when it was like Dickens certainly did. Preambles and Perambulations: Past, Present and Future: Creative minds at 48 Doughty Street. Saturday 24th April 2010 – Saturday 8th May 2010. ARTISTS: Larry Achiampong, Bram Thomas Arnold, David Berridge, Marco Cali, Maurice Carlin, Jeremy Evans, Anna Chapman, Pippa Koszerek, Yaron Lapid, Sophie Loss, Jane Madell, Penny Matheson, Aidan McNeill, Duane Moyle, Dermot O’Brien, Gary O’Connor, Claudia Passeri, Steve Perfect, Veronica Perez Karleson, Jonathan Trayner, Mary Yacoob. Private View (entry free): Friday 23rd April 2010, 18.00 – 21.00. A conversation with the artists: Saturday 24th April 2010, 14.00 – 16.00. Performers and Readers: Saturday 1st May 2010, 14.00 – 16.00. Exhibition open: Monday – Sunday, 10.00 – 17.00. Normal museum admission charges apply.